Capillary action is when water pulls itself up a paper towel, glass tube or a tree. It is going up, which results in an increase in potential energy. According to the law of conversation of energy, energy cannot be created or destroyed. Where does this potential energy of capillary action come from, or is this an exception or something? My question is different from How does water defy gravity in paper towels?, because the other question is asking why it moves up, but mine is asking where the energy comes from. A very interesting question. I believe The Young-Dupre equation describes a this. You could rationalize the climb of the liquid as being caused by the release of energy that is associated with a phenomenon known as wetting (see image). You can relate the wetting angle of a droplet on a solid material to the surface energies of the different interfaces (gas-liquid, liquid solid, and solid-gas). These energies (labeled as sigmas) are listed as energies per unit area. This means that for every unit of area I increase the droplet by, I have to decrease the other areas by a similar amount. This often releases some energy (from the newly wetted solid-liquid area and the increased the increase in liquid-gas area), but it costs some amount of energy to disrupt the solid-gas interaction too. We balance these energy factors with three terms of as sigma*the respective area. Now, if we want to get an idea as to if a droplet will climb, we can look a droplet's wetting behavior. If the droplet wets the solid (say water and paper) with an angle less than 90 degrees, then we can conclude that wetting is favorable. Accordingly, favorable wetting releases an amount of energy (usually as heat, usually small). However if the liquid must climb up the walls of a tube in order continue to wet, it can do so spontaneously, to a point. I am personally not sure what that point is, but surely involves balancing the surface energies and their respective areas, given some knowledge about the geometry of the surfaces. To answer your question explicitly though, the source of that increased potential energy comes from the energy released upon wetting. Where does this potential energy of capillary action come from, or is this an exception or something? First, the laws of thermodynamics still apply. Second, you have to account for the energy balance when you go from dry to wet on the one hand, and continuous flow on the other hand. Initial wetting of the paper towel or glass tube: Quoting from one of the comments, "the increase in gravitational potential energy is countered by a reduction in the chemical potential of the substances due to a change in the areas of mutual contact". That explains why the capillary fills up in the first place, and in this case it is fine to say "water pulls itself up". Continuous flow. If you are asking about a tree, where there is continual flow, you are not increasing the water-capillary contact area anymore, it remains constant. The energy has to come from somewhere else. It takes some energy to remove a water molecule from the top of the capillary because as you do, you are pulling all the water molecules up a tiny bit. As explained in the excellent video by Veritasium, water can have negative pressure in the capillary, so trees can grow higher than atmospheric pressure might suggest (thanks, A.K., for the pointer to the video). This is not a problem for the tree because the top of the tree is the site of photosynthesis, so there is free energy available to do the "pulling". So you can think of the water-filled capillary serving both in the role of the rope and the bucket, if you compare it to fetching water from a deep well. In cases where the water simply evaporates, the energy comes from cooling down the surrounding as the water molecule pulls up another water molecule and evaporates. In the case of continuous flow, water does not "pull itself up", something on the top (or bottom) has to provide the energy. For example, if you put a towel in a bucket of water with the towel reaching over the rim a bit, the towel will get wet. However, if the end of the towel outside of the bucket reaches below the water level, it will continuously siphon water out of the bucket, with water dripping from the towel. As an aside, it does not take much work to lift a water molecule up a tree (1.8 J/mol for a 10 m tree). Hydrolysis of a single ATP affords about 50 kJ/mol under physiological conditions, so it is sufficient to get 25,000 water molecules up the tree.Gravity is weak compared to electromagnetic interactions, which dominate in chemistry. None of the answers answer your question, they just layout equations of how to calculate the force/energy. To understand where the force comes from, you have to understand a surface conceptually. Think of the energy input required to make a surface (break something). It takes energy input to break the bonds between atoms to make a surface, thus a surface has an inherent energy. In fact image breaking the object in pieces until you only had atoms. Think: how much energy would that take? If we recognize that bunch of unbonded atoms are in a gas state, then we can know that this energy is the same as the heat of sublimation. Unless your material is a gas at equilibrium conditions, it will want to reduce surface area to release the energy inputed to break apart the material. This is why water in space forms a sphere, it is trying to minimize energy which means minimizing the amount of surface. Now consider a solid-liquid interface. 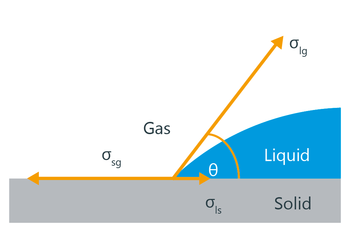 If the surface energy (enthalpy of sublimation) is higher for the solid than the liquid, then when the liquid covers the solid energy is released by the destruction of the solid-gas (or solid-vacuum) interface, but some of that energy must go into creating more surface area of the liquid-gas interface. This will cause the liquid to sprawl out and is referred to as wetting. If the surface energy of the solid is less than the liquid, then energy will be released by breaking the solid-liquid interface which will cause the liquid to contract forming a bead which is non-wetting behavior (a very creative term). Chemical potential is a form of work. In my opinion, the most important form of work in chemistry and chemical engineering. Not the answer you're looking for? Browse other questions tagged water energy surface-chemistry capillary-forces or ask your own question. Where does the energy of formation of covalent bonds come from? How does the Lennard-Jones potential relate to energy? In equilibrium, if bonds are constantly being created and broken, where does the energy that does so come from? How much water evaporates during a given time? In the production of vinegar, where does water come from? From where does sea water get salt? Capillary action only works with glass tubes?